Project is a 12,000 sq. ft. fit-out for the Duke University Margolis Center for Health Policy in Washington, DC. DesignTech collaborated with architect Wingate Hughes on this project which included mechanical, electrical, fire alarm, plumbing, and fire protection design services. Due to the project footprint, the design was required to comply with the DC Green Construction Code. DesignTech served as a team leader by completing the required documentation and directing team members on applicability/compliance paths of each green code requirement. Design scope included demolition drawings and coordination with the base-building design team who was completing core renovations at the time of the fit-out. Mechanical design included new supply air branch ductwork and air devices. The central feature of the space is a 48-96 person conference center which was designed with soundlined transfer air ducts for acoustic needs as well as heating and cooling VAV air devices by Thermafuser to retrofit the existing constant volume re-heat design of the core HVAC systems. The IT spaces are served by a new thermostatically controlled exhaust fan which provides after-hours temperature control. 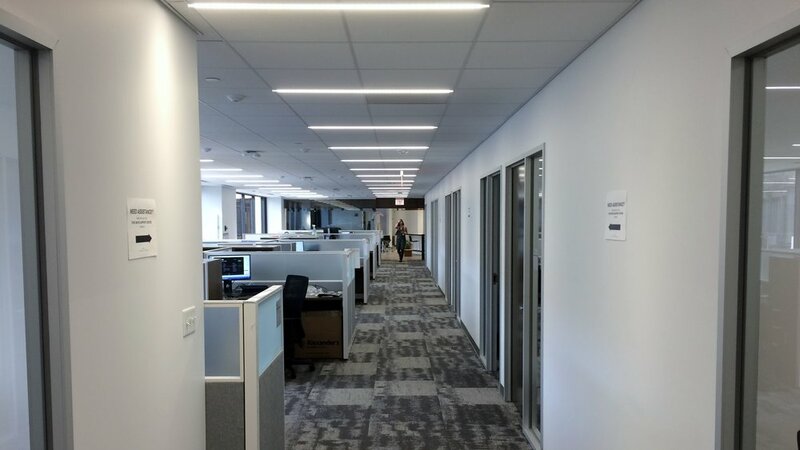 Electrical design included new high efficiency LED lighting, automatic daylighting controls, and occupancy controls in accordance with green construction code. Scope also included power connections to new systems furniture. These connections required specification for ground penetrating radar scans prior to core drilling and installation of fire-rated poke-through devices. Power connections were also designed for connection to mechanical and plumbing equipment. Fire alarm design included notification appliances and control modules for interface between fire alarm system and electrified mortise locks. Plumbing design included new tankless water heaters at each pantry fixture, garbage disposal, and water connections to the refrigerator. Scope also included sanitary and water connections to new pantry sinks. Due to piping restrictions, each pantry was designed with waste pumps for each sanitary drain. DesignTech completed this project in Revit design software which supported a reduction in construction RFIs as well as a high level of coordination between the engineering and architecture disciplines.